Yesterday (Saturday) I spent eight hours rolling around on a (heated!) concrete floor with a bunch of mostly strangers people I am getting to know pretty well and bits of what used to be my car. It was a lot of fun! 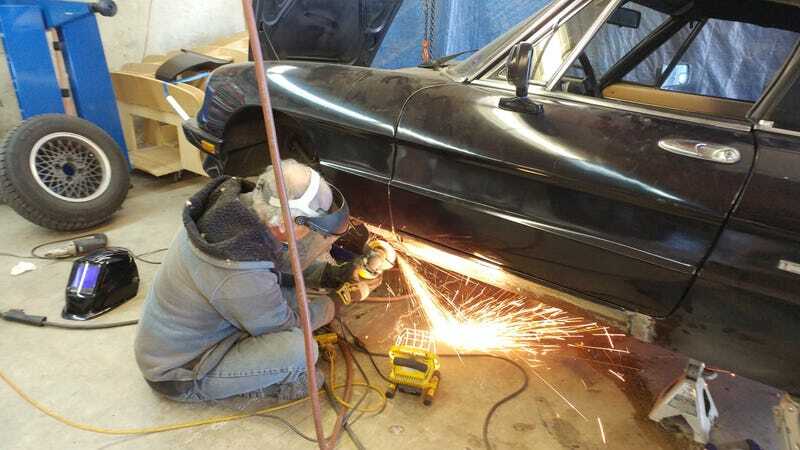 The latest step in the quest to fix the in-retrospect-not-actually-all-that-bad rust on my Alfa Romeo Spider was to remove the outer rocker panel, cut away any rust under there, and patch things up as much as possible. The process started with me taking a pair of “electric sheers” to the rocker. I have never seen these before. I made a complete hash of it. Also I scratched the hell out of my door while doing it. Good times. Anyway... after that we peeled the rocker down and began attacking the spot welds with chisels and hammers. This... didn’t go great and eventually we were granted a reprieve when the air chisel showed up. Rocker panel off, we get to see the horror beneath. Actually not all that horrifying. After that we cut out the worst of the inner rocker and inner fender rust, and began welding in repair panels. Finally my years of binge watching Edd China do metal work paid off and I got to use some of his “paper and dirty finger” template making techniques. The first two patches were pretty easy, but the last was a doozie. It ended up needing to be rolled in two directions and generally very complex. Luckily David is pretty handy with body work (he is building his own replica from sheet metal... which I don’t have a picture of or any more data about) and has all the toys. He took it easy on us and fabbed the last piece as I watched and tried to absorb as much as possible. One patch in, another fitted and ready to go. Yes, they aren’t pretty, but they are functional. After welding those in and grinding back the welds a little, we were basically done. We took a moment to attach the chassis rail with a hydraulic ram to make it less... ruined... and that also went well... even if I didn’t take pictures. Next up is to treat the old rust to some rust converter, then prime and paint the whole thing. Then we’ll weld in the replacement panels. Both chassis members also need moderate repairs and the driver’s floorpan. So one of the reasons the Alfa club was kind enough to do this was because two other members both have Spiders (but the good ones) with rusty rockers. Unfortunately for them, when you take a look at theirs the outside skin is in excellent shape... but there isn’t anything behind it anymore. All rust. They’ve got a lot more work ahead of them both because of the quantity of rust and the worth of their cars. Duettos (1st gen Spiders) are worth about 10x what a 3rd gen is worth, so doing the repair perfectly and with no filler is a lot more important. I know my car will never be a concourse car, so “good enough” is indeed good enough. The Alfa was granted a temporary reprieve!